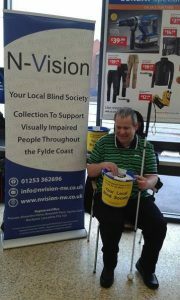 Our volunteers will be holding two collection days at the Sainsbury’s store in St Annes on Friday 7th July and Saturday 8th July. If you are shopping in store on those days please come along and say hello to our volunteers. You will see our large N-Vision banner so you can’t miss us, we’ll be delighted to meet you. We will be in store from 9.30am to 5.30pm each day.